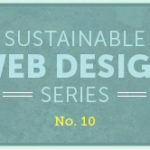 In our next Sustainable Web Design post, James considers ways to save energy while surfing the web. At Mightybytes our designers and developers are always looking for new ways to create sustainable web design and code, but we also strive to reduce our carbon footprint at home. 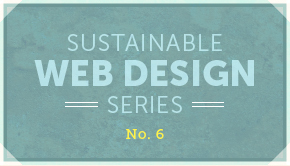 Every bit of content you consume on the internet has a carbon footprint, and small amounts add up quickly. Here are a few quick and easy tips for folks who want to become more ecologically conscious consumers of content on the web. The US Department of Energy recommends that you power down your machine if you’re going to be away from it for more than two hours. If you have trouble prying yourself away from your screen, set a reminder on your computer or device to power it down and take a break. You may find you have more time to do other things! Yes, there are other things outside of browsing the internet. There is a running debate about the environmental impact of a sleeping computer. Even in sleep mode, your computer continues to burn energy. The average energy efficient laptop burns between 15-60 watts of energy while in use, and 2-5 watts of energy while in sleep mode. Set your computer to go into sleep mode after a certain number of minutes so that it can run more efficiently while you’re away from it for shorter periods of time. Generally speaking, if a device or adapter is plugged in even while it is powered down, it is drawing at least 0.5 to 2 watts of energy. This is known as “vampire power”. Some devices (televisions) are worse than others (mobile phones) at leeching power while they’re powered down, and some companies are making power adapters that prevent your charger from leeching power if it’s not connected to a device, and prevent your devices from leeching power once they are fully charged. But to prevent “vampire power” entirely, unplug chargers that aren’t in use or use an energy-efficient power strip. Simply put, tablets use far less energy than laptops or desktops. Consider your task and if you don’t need to use a desktop or laptop, use a tablet instead. In some cases, watching a movie or show on a tablet may also be greener than watching it on a television. Although Microsoft argues that Internet Explorer 9 is the most efficient of the five major browsers, there isn’t a definitive choice for green consumers here. Browsers use resources and drain your battery. Some use more than others and constant updates make it difficult to tell which browser might help you save a little energy. This is a game of he said, she said. Now, there is another element to consider here. The elephant in the room if you will. If consumers go electronic to save the trees, but electronic devices that become obsolete the day they enter the market, you have a nightmare e-waste problem on your hands. Currently, 54% of all e-waste goes into a landfill. Apple alone emits 10.2 metric tons of greenhouse gas annually. At what point does the amount of lead, arsenic and mercury entering the environment via discarded electronic devices surpass the impact of destroying trees? If we cannot decrease the waste generated by electronic manufacturing, and don’t have a solid recycling strategy for e-waste, we are likely to continue to destroy the planet at an alarming rate. I hope this post gives you the information you need in order to use energy efficient devices while online and to save energy offline. Please leave a comment with any tips we may have missed below. Check out our newest product Ecograder.